Alexander Hamilton Holley works on and oversees the preparation of the land and building of his house. Alexander Hamilton Holley moves into his new house. staircase from the front to the back of the house. Rudimentary indoor toilets are built on the first floor. A cistern is added to the third floor for collection of rainwater which drains to the kitchen. This augments the water supply from the well that had been dug as part of the original construction. Alexander Hamilton Holley dies. Sarah Coit Day Holley (his third wife) continues to live in the house. Sarah Coit Day Holley dies. continue to live in the house until their deaths in 1914 and 1901, respectively. Holley/Rudd estate divided among the four surviving children. Charles Edward Rudd inherits Holleywood and 8 acres of land as his share. Charles Edward Rudd engages architect Gerard Fountain to bring the facilities up to date. enlarging the second floor bedrooms, updating the plumbing and adding electricity. 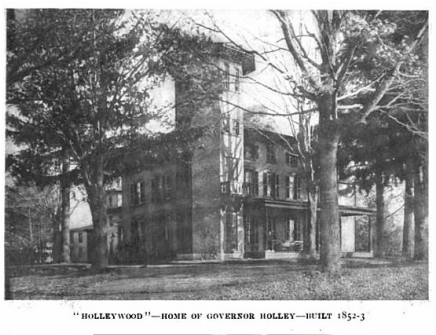 It is believed that Holleywood is the second building (after the Holley Manufacturing Company) in Lakeville to have electricity. Charles Edward Rudd replaces coal burning furnace with an oil burning one. Charles Edward Rudd dies. Emma Sands Reese Rudd (his wife) continues to live in the house until her death April 17, 1965. John Krom Rudd (their only son) makes and oversees major repairs and improvements to the house, including new plumbing (1967) and electrical systems (1971), new oil burning furnace (1969), complete interior decorating (1972-73), replacing the flooring of the west porch (1979), connecting to the town sewer line (1983), replacing the roof (1993), replacing the oil storage tank for the furnace (1996), replacing the furnace (2008) and replacing the west porch (2009).